The revival of Hans Gál’s music continues apace, to the point where we are beginning to get some of the works recorded more than once. Not only are there now two versions of his Cello Concerto available (on the Avie and CPO labels), but the present CD provides two solo cello works that are already available on Toccata Classics. Perhaps it is not too much to hope that this marks the beginning of some kind of “bandwagon effect” that will help stimulate further interest in Gál’s very approachable music. Gál wrote eight concertante works (possibly nine, if you count the Fourth Symphony styled “Sinfonia Concertante”), and these are spread throughout his career. As well as concertos for piano, violin and cello, Gál wrote five concertinos for piano (1934), violin (1939), organ (1948), treble recorder/flute (1961) and cello (1965). The name “concertino” normally suggests a work of modest scale, or one involving frivolity or comparative lightness of touch. Whilst this is the case – at least in terms of scale - with the piano and violin concertinos, Gál’s concertinos can be on the same scale as his concertos and just as serious (the Cello Concertino, for example, is almost as long as his Violin Concerto). It seems that the composer used the term “concertino” principally as the designation of concertante works where the orchestra was limited to strings. The present disc provides us with the first recording of the three-movement Cello Concertino, a late work (the composer was 75 when he wrote it) written without commission and premiered in 1968. The first movement Molto moderato – Quasi allegro is based on the six-note cell that opens the work, although this is far from obvious to the casual listener. Dark and unsettled, the music’s use of strings alone gives it a slightly English flavour – not far from some of Finzi’s music. The elements of sonata form may be present, but on a first hearing it is difficult to discern that kind of structure. Gál seems to go in for continuous development. The second movement, supposedly a bitterly tender Adagio, actually struck me as not notably different in mood or speed from the first. Kenneth Woods’s booklet note suggests that “Gál could have made a killing in the lullaby-writing business” but I would not necessarily expect to use this music to get a baby to sleep. The last movement provides the lighter touch we might otherwise have expected, and offers a quirky and somewhat humorous theme. It has the strange marking Allegretto ritenuto assai (slightly fast but very held back) but it proceeds to trip along here at a fairly constant Allegretto tempo without any notable sense of being held back (apart from the odd Rit. and a brief cadenza for the soloist). At any rate, this is very listenable music and, although I think it will take me several hearings for any of its themes to lodge in the mind, I shall return to it with pleasure. 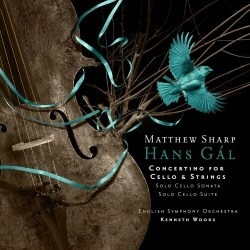 An article on the web with some biographical details about the soloist, Matthew Sharp, indicates that an early influence was the great cellist Daniil Shafran. Sharp’s passionate, intense and (occasionally) slightly strident tone has something in common with Shafran’s. It cuts through the orchestral strings and rises easily above them. He sometimes eschews vibrato, which enhances the effect. The performance by both soloist and orchestra sounds excellent to me, and I very much enjoyed it. On a first hearing the recording struck me as slightly hard but, on subsequent hearings, it came over more as vivid and immediate. It is certainly very well balanced and atmospheric. Booklet notes are acceptable but provide relatively slight analysis of the works. There are also translations in French and German, some family photographs of Gál and family and extensive artist biographies. A very successful release, then, and we must applaud the generosity and the significant effort expended to fund these recordings.